Tendering of contracts (where appropriate). Colour consultancy service, encompassing Resene RenderRite colour visualisation, custom colour creation, colour matching and the development of colour schemes. 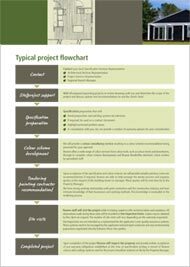 While some projects require the full-service approach where the Resene representative is involved in all steps (see flowchart opposite), it is also common for building owners and managers to manage the project more closely and run their own tenders. 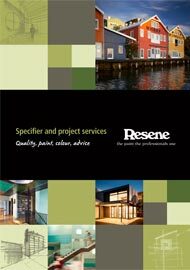 In these situations, owners, managers and specifiers are welcome to seek our advice on suitable coatings and application to assist with their new build or refurbishment programmes. Full support at all stages of the project. 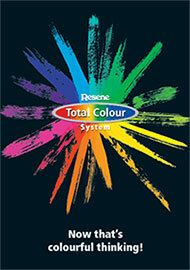 – the Resene Total Colour System. Quality products backed by ISO 9001 and ISO 14001 certification. 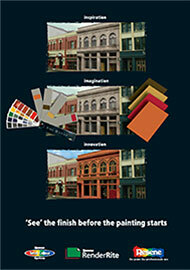 Please contact your Resene representative or your Resene ColorShop for further information, or contact us.